The best destination according to your sign: where to travel next? There are so many beautiful destinations on the Earth that sometimes is hard to choose just one to explore. Between sea and mountain, city and countryside, your mind can wander a lot. So why not rely on your personality and pick the destination according to your sign? 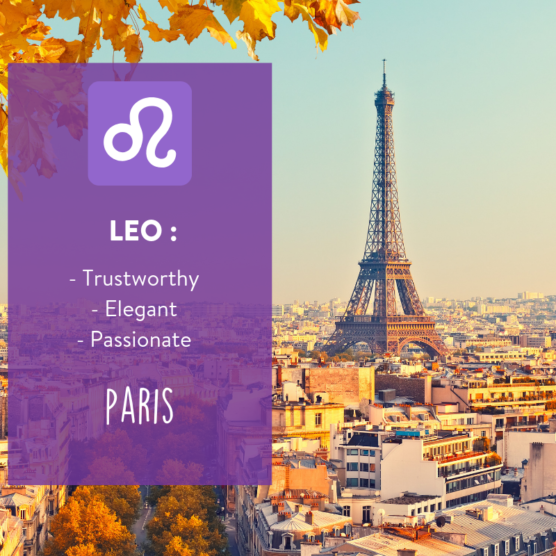 Among the 12 signs of the zodiac, discover which destinations suit you best. If you don’t trust the zodiac, you will find some good ideas for holidays for your next adventures! Make room for the rams! The first sign of the zodiac is often characterized by audacity and intuition. Nothing and no one can stop the rams. Their fiery temperament leads them to amazing experiences and 200% guaranteed fun. There is no doubt that with such an energetic personality, Aries are naturally attracted to sport destinations. So an adventure getaway would be ideal. According to their personality, Aries will enjoy winter sports in a destination like Salzburg in Austria. It’s nearby the ski slopes and the Alps will definitely meet their needs for adrenaline. Bulls are sincere people, known for their great human values. With Earth being their element, they are very close to nature looking for authentic experiences. Taurus generally prefer the quiet countryside than the chaos in the city. 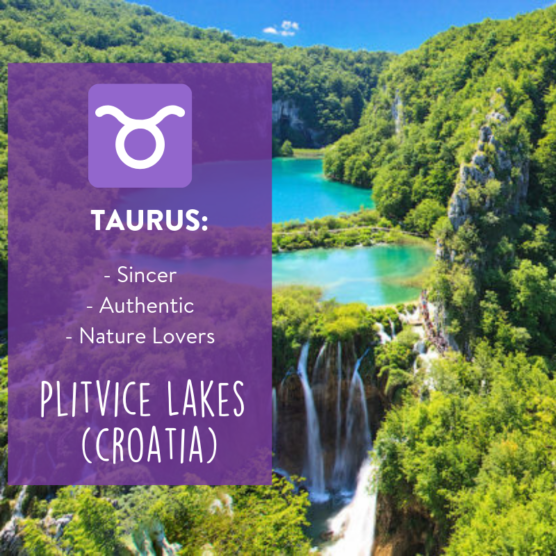 If your sign is Taurus, a green destination is ideal for nature lovers. Are you Taurus? Then the best destination according to your sign is Croatia breathtaking landscapes. With its national parks inscribed on the UNESCO World Heritage List, Plitvice will delight all nature lovers. Sociable and enterprising, the ones born under the sign of Gemini love to be surrounded by people. Equipped with great curiosity, when it comes to friendships. Gemini are the best with their infectious smile. The people from this sign, are therefore naturally able to make new friends during their travels. In addition, their curiosity and desire for knowledge, motivate them to immerse in new cultures. Cosmopolitan destinations, with local communities from various cultures, are therefore the most suitable places for Gemini. New York is an excellent cosmopolitan destination for their soul. The Big Apple will perfectly combine the spirit of the with New York’s various neigbours such as the “Little Germany”, the ‘’African-American’’ to ‘’Harlem” neigbourhoods to “Little Italy” and “Chinatown “. Generous and affectionate are the two adjectives that best describe Cancer. 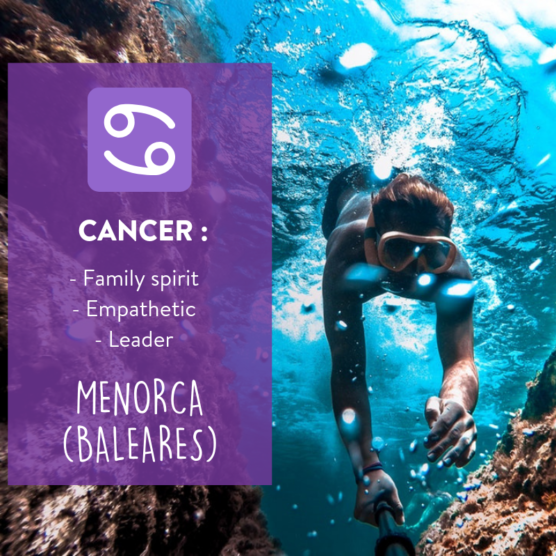 Cancers have the family spirit and a sense of loyalty and incomparable friendship. Their calm and empathy allow them to be good leaders and they are the best at organizing a great family vacation. What better family destination than the Balearic Islands? Each family member will find pleasure and peace in the calm beaches to the rich historical inheritance of the place. The island of Menorca seems to be the best choice among these islands, but we also advise you to read our selection of the perfect places to travel with your family if you want to discover other horizons. Lions are far from being the most discreet. They are elegant people but also full of passion. Their nature often helps them to outshine and be admired by everyone. That explains very well that their element is fire. Their extravagance and energy are perfectly matched with city breaks in major European cities. Therefore, Paris comes first to our mind, the capital of love and the world’s fashion mecca perfectly suits the Lions. See our travel guide of Paris if your next trip is to the city of lights! However, other destinations that might go with their personality are London or Milan. And amazing holiday homes for an amazing vacation! The blank sign represents all the organized, meticulous people who also come across as art and creative people. The Virgos feel very comfortable in society and know how to surround themselves with optimistic and interesting people. A little “hipsters”, they like to discover original destinations whose architecture and artistic heritage are worth the visit. 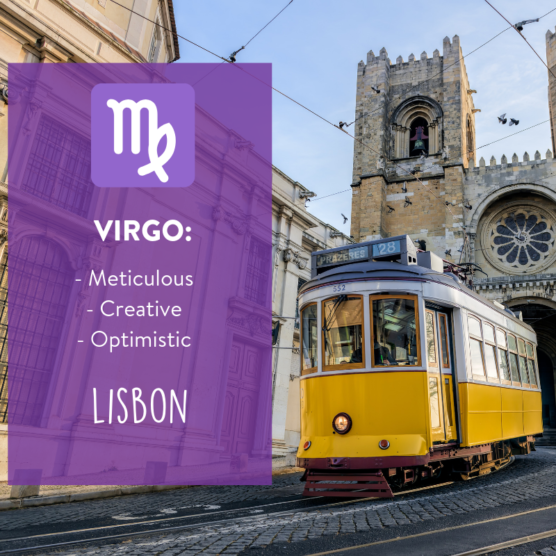 We think the best destinations for Virgos is Lisbon. Indeed, the capital of Portugal offers an enchanting atmosphere with its charming tiny steep streets, its historical monuments, its vintage shops, and its retro yellow tram. Just because, we know Virgos like organizing everything, here is a detailed travel guide of Lisbon. With air as their element, everyone knows that Scales are in search of the perfect balance. 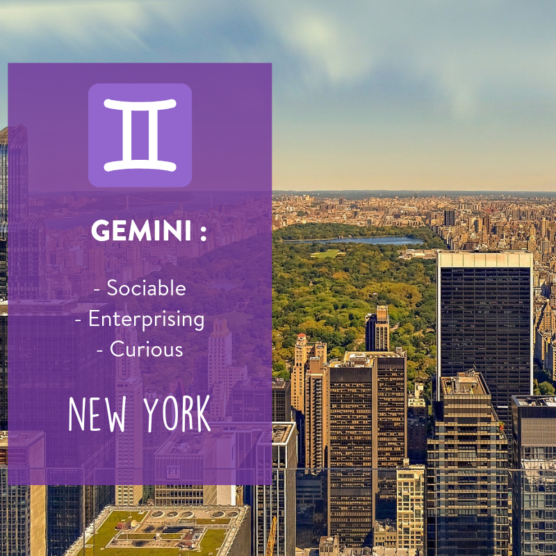 Like Gemini, they are diplomatic in nature and seek harmony for their family or group of friends during their travels. Their destination must be a mix of culture, recreation and rest. This sign prefers welcoming, rather small cities than large capitals. 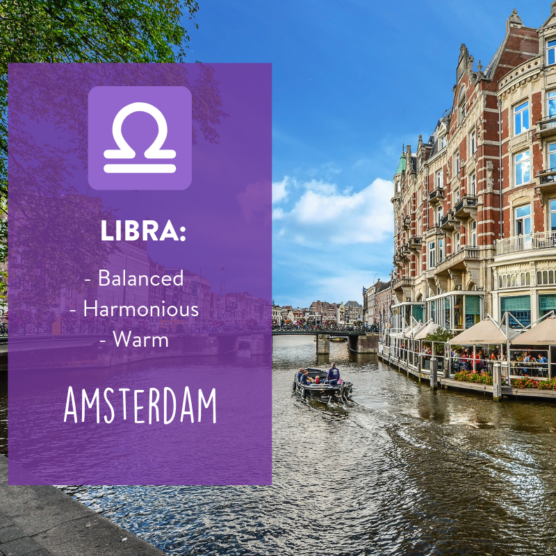 If you are Libra, the destination according to your sign is Amsterdam in the Netherlands. This vibrant and hospitable city offers a multitude of activities ranging from historical tours to art exhibitions to an exciting nightlife culture. In France, the city of Bordeaux can also meet the criteria for this sign of the zodiac. Scorpions are ambitious and risk-taking because they always want the best for themselves and their loved ones. During their vacation, Scorpions take the opportunity to go to a place where they will find a real experience. 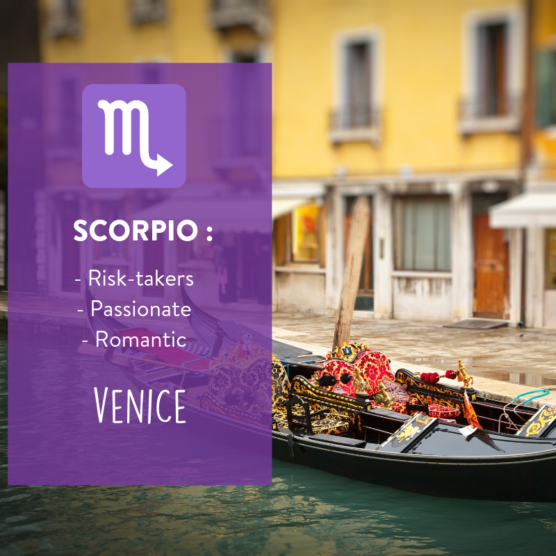 In search of unforgettable and passionate moments, the Scorpion is attracted by romantic and unique destinations such as Venice in Italy. If you don’t want to miss out anything, look up our 3-day guide through Venice! Sagittarians are always in a good mood, so traveling with them is pure pleasure. Filled with wisdom and being open-minded human beings, they are looking for cultural enrichment and change of scenery when choosing their destination. 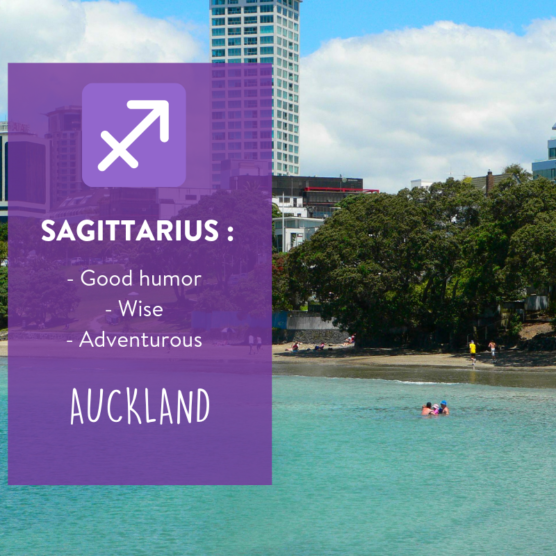 To make the most out of their trips, Sagittarius need to encounter different cultures and go off the beaten track, thus Auckland in New Zealand is the best match. New Zealand is the land for them as they will discover wild species, see magnificent landscapes and will immerse themselves in a totally new way of life. To be Capricorn is to be a rational person but also reliable, honest, and you can always count on them. Of a reassuring nature, the Capricorns are the perfect partners to go on adventures with, in regions with challenging climate conditions. If you are Capricorn, what’s the ideal destination according to your sign then? 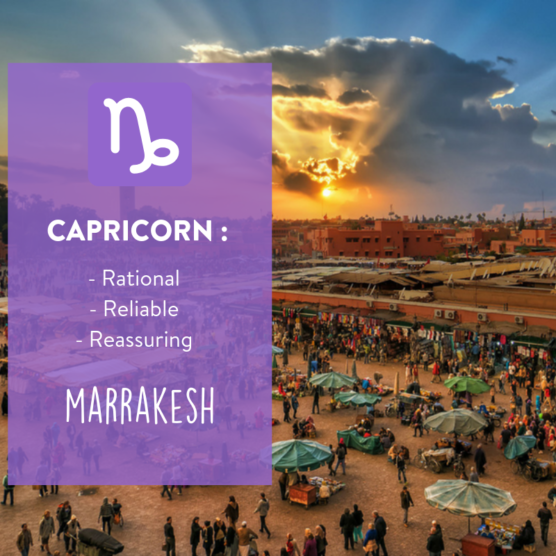 The Capricorns leave nothing to the chance and are ready to go on an expedition in the deserts around Marrakesh. In addition, to test their comfort zone, they will also quench their thirst for unique and magical landscapes. Independence – this is the most accurate word that describes them. 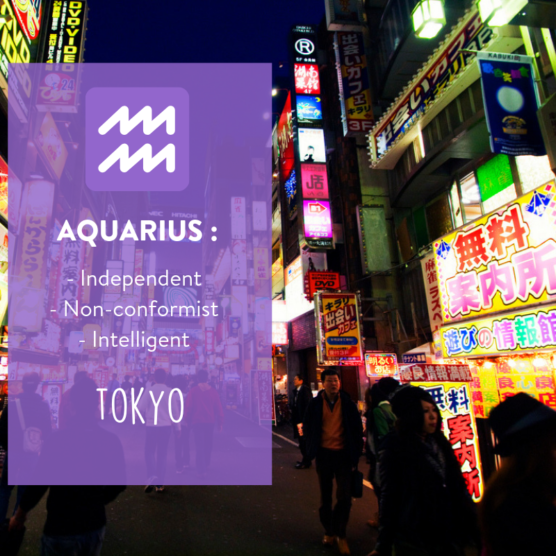 Generally visionary and intelligent, the Aquarians love to swim against the current and often prefer to organize their own trips to get off the beaten track. They love solo adventures and tend to choose their route on a whim, even though sometimes this might be the wrong decision. The Aquarians need freedom at first place. Therefore, we recommend the futuristic city of Tokyo in Japan. The unconventional San Francisco in the United States may also be a good destination according to your sign. The Fishes tend to have dreamy and generous nature. They are easy going and are usually great travel buddies. They like taking their time to think, and hate being in a rush. Their element being logically the water means that they need to be surrounded by the sea or at least a city that borders a river or a lake. This is the perfect setting for the Pisces in order to escape the stress and completely enjoy their holidays. 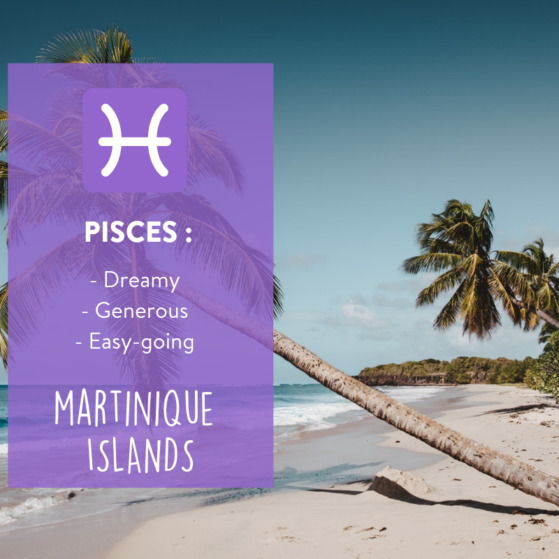 The island of Martinique seems perfect for the nature of the Pisces. Relaxing on the beach while drinking from a coconut. What a dream!